Mera tries to convince Arthur Curry to fight in a new Aquaman clip. The countdown is officially on as the promotional campaign for Aquaman is underway, providing new looks at the movie as well as some behind-the-scenes secrets and even some pranks that went on while filming. Amber Heard was recently interviewed about her experience on the set of the action movie, and she reveals that the cast and crew had an excellent time during production, even though they worked 16-hour days for a lot of it. Amber Heard's Mera is the focus of the latest Aquaman clip as she approaches Jason Momoa's Arthur Curry. Mera is seen asking Curry to return to Atlantis and claim the throne as well as stop King Orm's impending war with the surface world. However, Curry doesn't seem very convinced that he should help out. It's a short clip, but it adds an extra layer to the relationship between the two characters early on in their first encounters. Amber Heard is an avid reader and liked to read in between Aquaman takes. Her books would often be off screen and then she would retrieve it when she had some free time. However, Jason Momoa would go over to her books when she was nearly finished with them and tear out the last 30 or so pages, leaving Heard incredibly annoyed that she couldn't finish her books. According to Heard, Momoa wanted her to pay attention to him in between takes so that they could have fun. Momoa likes to play guitars, but reading doesn't seem like it's his preferred method of relaxation on the set. In order to let Amber Heard finish her books on the set of Aquaman, the crew designed a special book bag made out of green screen material that she could always have strapped on to her while they were filming certain scenes that involved harnesses. All Heard had to do was take the bag and bring it forward, which kept her books safe from the wrath of Jason Momoa. While the act of ripping out book pages seems a bit cruel, Heard assured that it was all done in good fun, although she did not reveal if Momoa replaced the books or not. 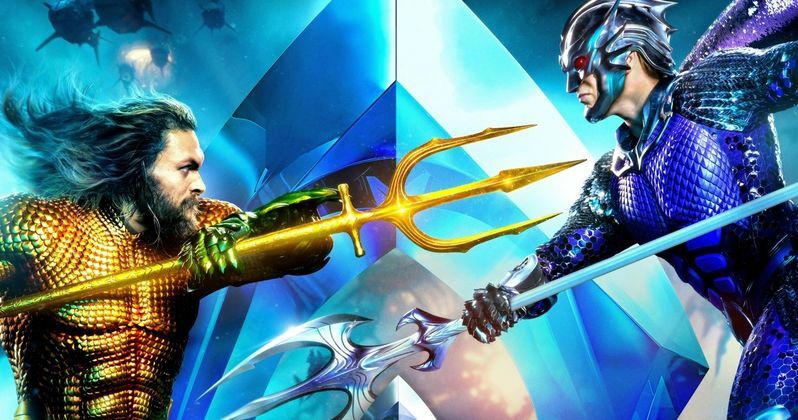 Aquaman swims into theaters on December 21st and it looks like it's going to have a strong showing at the box office, according to the early predictions. All of the promotional material looks great for the movie, and James Wan appears to have done an awesome job on the visuals with his team, who worked for months through the post-production process. Now, we just have to wait for it to finally open. You can watch the new Aquaman clip below, thanks to the Good Morning America YouTube channel. The footage starts at the 4:39 mark. As for potentially meeting Jason Momoa, it might be best to not have a book with you because he may tear out the pages.